If you have been in a traumatic accident or had severe decay affect one of your front teeth, then this blog might interest you. In the past, it was difficult to replace missing front teeth while maintaining an ideal esthetic appearance. This is because the only solution was to either make a removable denture with a metal clasp or a fixed dental bridge that could leave much to be desired cosmetically and have negative effects on dental health. But don’t worry because we now have cosmetic dental implants that solve this problem. An implant that is placed today can last decades. Additionally, an implant will also prevent the loss of the bony ridge that holds your teeth in place and creates the profile of your face. Once the dental implant is surgically placed, your dentist will then have a firm anchor to which they can cement a beautiful dental crown and complete your smile. Not only are dental implants superior cosmetically, but they are also better in regards to your dental health. Removable dentures can increase the likelihood of cavities and loose teeth. To place a dental bridge, you must remove a lot of sound tooth structure in the areas adjacent to the missing tooth. 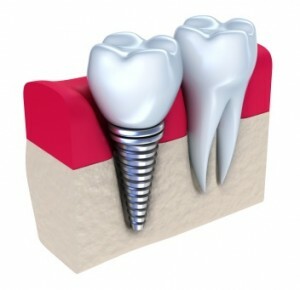 Dental implants are the ideal treatment for patients with missing teeth. To learn if you are a candidate for this procedure, call Nashville Center For Aesthetic Dentistry today and schedule a consultation with Dr. Dennis Wells.